You like to glug your beer right from the bottle, but your spouse is aghast at the site of direct bottle sipping. 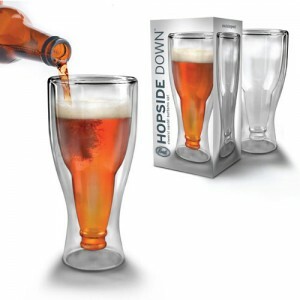 Well, now there is the Hopside Down Beer Bottle Glass, the perfectly acceptable compromise. You get a bottle look but she gets the classiness of an elegant glass to impress the guests.